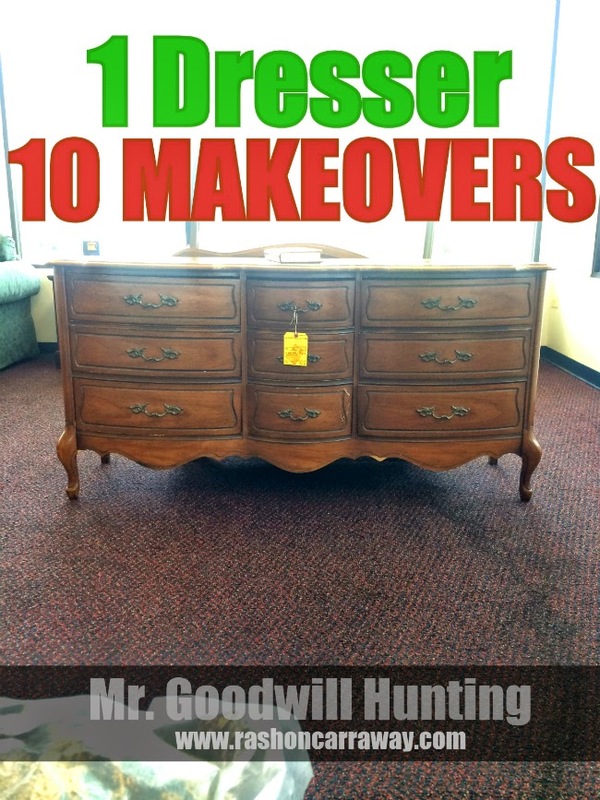 1 Dresser - 10 Makeovers! When I am out at thrifting, I am always interested to see how others view the same thing I ding interest in. As I do quite often, I uploaded this photo to the FACEBOOK page on last week as for a few makeover ideas and boy did everyone have some great suggestions. If you aren't following the Mr. Goodwill Hunting Facebook Page, you should really do that. 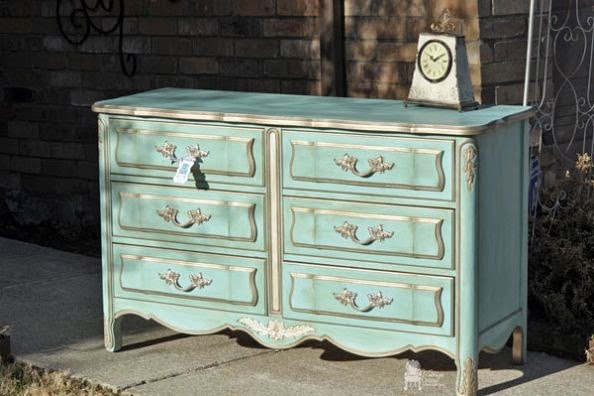 Since all of you gave amazing ideas, I went on the hunt to find some amazing makeovers that you could probably use in your space, if you ever came across a piece just like this or very similar. 1. As with any DIY project we look for inspiration and what better way to find inspiration than from an overpriced furniture store, like Restoration Hardware. 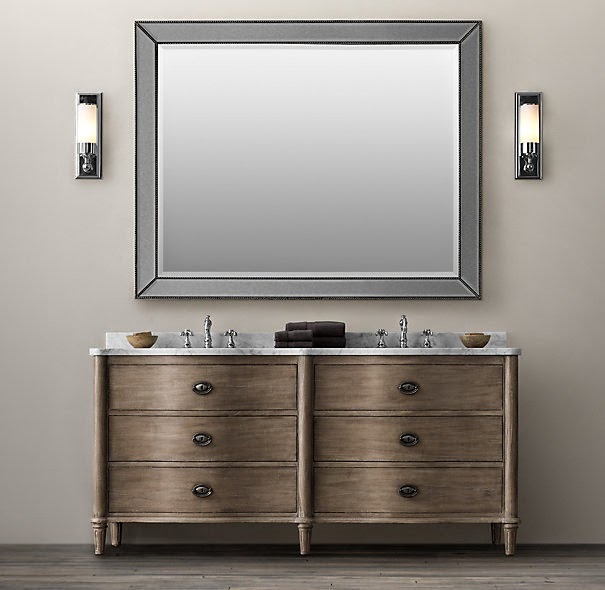 Although the details are a bit different, you could, with some elbow grease, turn a dresser into a double sink vanity. 2. See I told you. This was a dresser turned into a double sink vanity. They did an amazing job on this and I love the grey color and the stark white contrast . 3. I admit. I honestly just think of the front of a piece when I am considering whether it will work in my space or not, but I'd be doggone if the back isn't as useful! 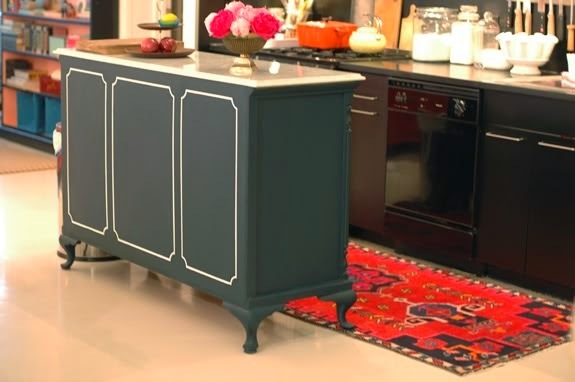 So how about turning that dresser into a kitchen island? 4. This soft gray is quite modern and the lines of the piece really keeps it in line with being "french provincial". However, when they decided to add those red knobs, that really took it to a whole 'nother level. 5. Although French Provincial is not my style, it still is an excellent redo. 6. I remembering seeing this piece when it was first revealed and thought, "That's brilliant!" 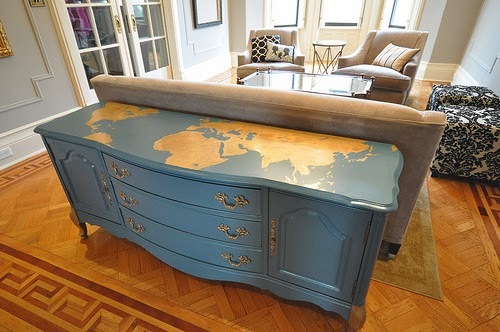 It takes a lot of talent to be able to paint a map on a solid surface. Well I mean, for me anyway, I cant draw. 7. Technically this isn't a dresser. its a desk. but can you deny the fact that this green is amazing? 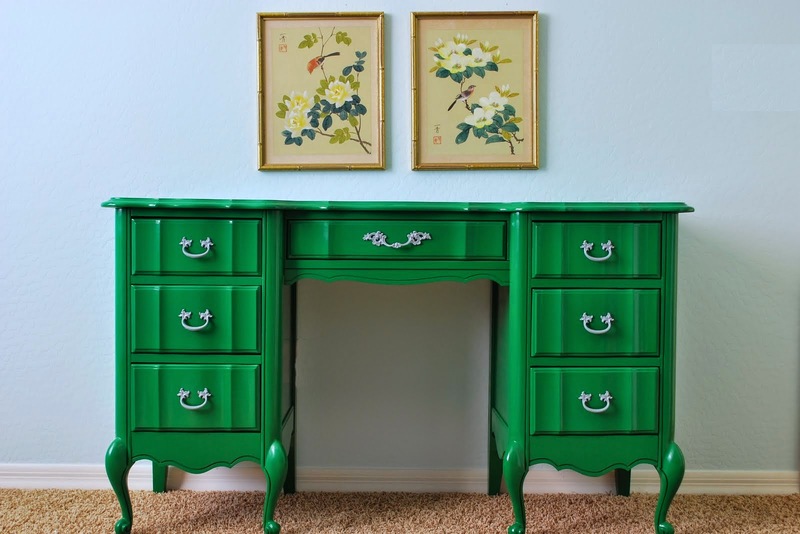 If you had the chance to do a make over with a dresser, I would honestly say this green is one you should try. 8. Have you seen anything so perfect for a little girl's room or perhaps a chic boutique? I know right. 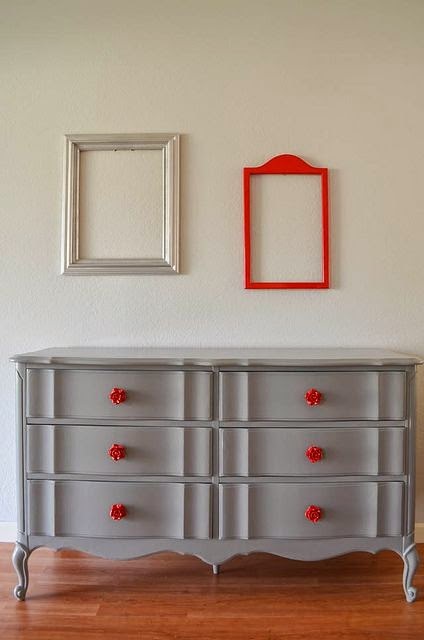 This dresser is a excellent example of what a little creativity and a lot of elbow grease can produce. 9. 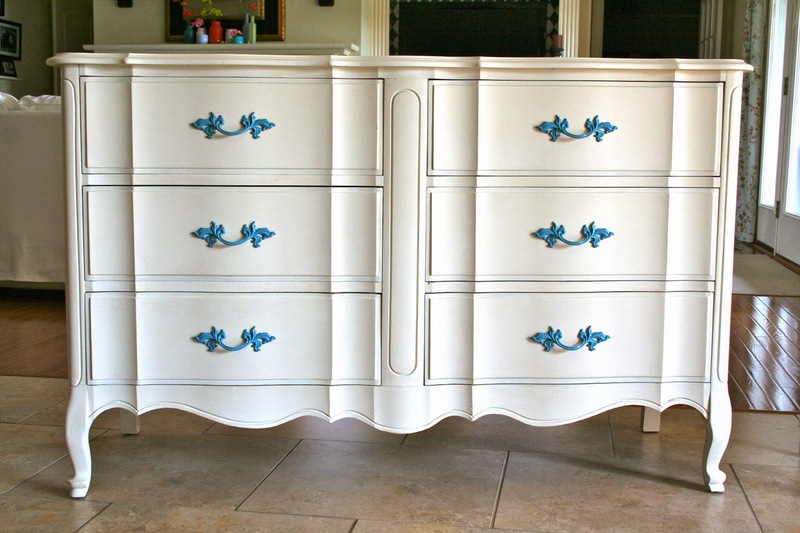 When you really have no inspiration or you are very nervous about committing to a bold color this white dresser, with a simple color change on the handle may be all you need. 10. WHAT WOULD YOU? Let us know in the comments!! It is always great to have inspiration stashed away in a folder, just in case you come across an amazing piece in a thrift store. I hope you have been inspired by these pieces to create something beautiful for your space!